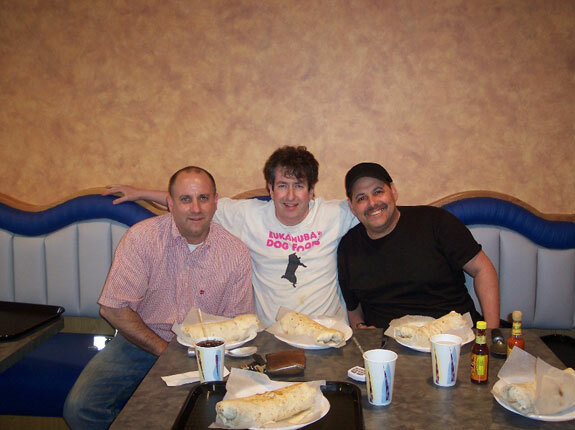 Article: Kevin Lipsitz - Adios, Monster Burritos! 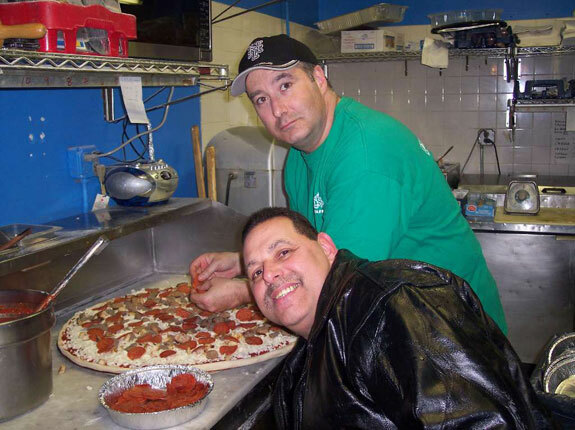 Hello Folks this is Cousin Chubby there will be one restaurant that I will NOT Recommend and that is Paulies Pizza in New Brunswick NJ. 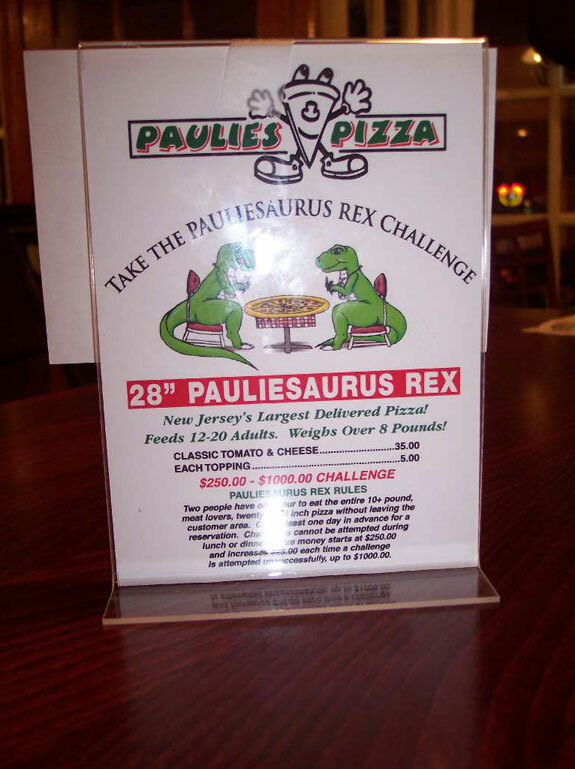 They advertise a 10lb pizza pie called the Pauliesaurus Rex for $58 and it is a challenge, eat it with someone else and the $300 prize money is yours! The only problem is that the pie apparently weighs closer to 22lbs. Don Lerman and Krazy Kevin Lipsitz gave a gallant try. Kevin and Moses weighed the pie with the tray at 17lbs and Moses was holding up the tray. They were told that the tray weighed 7lbs. After 80% finished there was 4 & 1/2 slices and it weighed closer to 5lbs. Afterwards when we asked to weigh the tray they said it was being cleaned and not available. 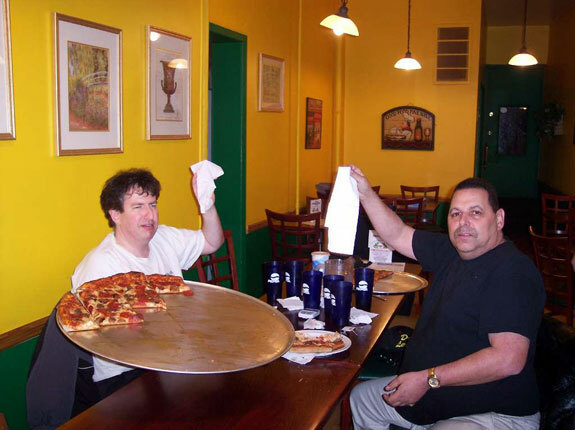 The pie was as thick as a Sicilian with a lot of meat on it. Here are some pics, judge for yourself. 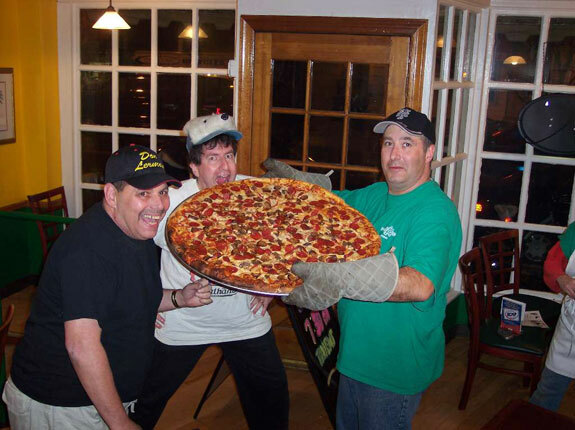 The pie was so big that Don had to hold part of it up while weighing it. The pie actually weighed more than this! Saturday, October 29, 2005: Don Moses Lerman, Beautiful Brian Seiken and I, along with Lorraine "Lorraineasaurus Rex" Lipsitz, met up at our home at 6:00 am sharp for a road trip to Bethesda MD. The goal was to arrive an hour or so early before the NOON EST check-in time. We all squeezed into my Hyundai Accent for an economical ride to Maryland. We made it there in plenty of time. We were all looking forward to Pat from Moonachie Philbin being there also, but we got the bad news that his car broke down on the way there, on the Delaware Memorial Bridge. Apparently his driveshaft dropped. Pat, we all hope your car is back in tip top shape and sorry for your bad break. When we got there, we met up with the manager of the Union Jack pub and settled into some really comfortable chairs they had. Soon everyone started coming in and soon Crazy Legs, Brian Subich, Allen Goldstein, Sonya Thomas all wandered on in. This is why I love participating in IFOCE events. I have as much fun before the events as during the events. While winning is paramount, it is not the be all and end all of why I participate. It is great to catch up with friends and many times they have travelled from all across the country, or the world, to the events. It is really something to be part of, when eaters have this type of dedication to come from all over the world, to eat for just a few minutes. Soon the wings came out and they smelled delicious and my hunger pangs started. Don Moses Lerman looked dangerous and unpredictable in his fancy suit and hat and many fans were in awe of him. He presents quite a forboding presence in this outfit. Soon it was time to begin and we were all called up, one by one. Then just before the countdown began, I went to shake eveyone's hands. I apparently skipped Beautiful Brian Seiken, which enraged him and he grabbed some pickles from his robe (why he had pickles in his robe I have no idea) and started beating me over the head with one of them and then threw the other at me. I just happened to have some cheap pickles in my pocket that I must have had there from a previous practice run and I smashed one on Beautiful Brian. Big Brian Subich came out of nowhere to break it all up and in the process, banged against the table, causing a loud screeching noise which frightened poor Sonya. With Big Brian blocking my access to Beautiful Brian, I then proceeded to toss the one pickle I had left at Beautiful Brian, hitting him square on his chest. Rich Shea, meanwhile, had started the countdown and I raced back to my spot to begin eating. 10-9-8-7-6-5-4-3-2-1-GO and off we went, furiously eating. I had Sonya on my right and the Great Don Moses Lerman on my left. I had decided early on that to place in this contest, I had to pace Sonya and the Great Don Moses Lerman. So I tried desperately to keep up with Sonya and gradually fell more and more behind. From the angle I was standing, it was hard to see Don Moses Lerman, so I focused on Sonya's jaws, trying desperately to keep up, albeit unsuccessfully. However, in the process, she dragged me kicking and screaming along, passing everyone else along the way, except Sonya herself and Tim Janus, although I did not realize it at the time. I zoned out everything else, including Rich Shea's voice.......the only noise I heard was Sonya's tossing of her next finished wing bone into the debris tray. About 7 or 8 minutes into the contest, I looked over to my buddy Don Moses Lerman and noticed he had slowed down almost to a halt. He had started off so strong and I was not sure what happened. Don had hoped for a chair, as he likes to eat in a sitting position, so his jaws are closer to the table. However, due to space constrictions, there were no chairs allowed up on stage. Between this and his back giving him some problems, the Great Don Moses Lerman had to slow down and could not keep eating at his usual furious pace. Then the bell went off, the 10 minutes were up. I was really feeling pretty down as it appeared I did not place. I had only gotten to just about the end of my second 3 lbs tray and others had gotten well into their 3rd tray and in Sonya's case......a 4th tray. Then I started looking at the trays coming past me with the wings of the apparent winners and noticed that they were not as well cleaned as mine. The great Don Moses Lerman had trained me well, in practice runs for the Philadelphia Wing Bowl for the last 4 years, to clean every possible speck of meat off the bones. Even though this contest was about weight, not thorough cleaning, old habits die hard. Anyway, I shouted for my bowl to be weighed and lo and behold, I was nearly a pound ahead of some of the others who had appeared to place ahead of me. This was a great win for me, finishing third, with 3.85 lbs. Although I have said it time and time again, winning is not the only way to have fun.......... it sures feels good to go home a winner. 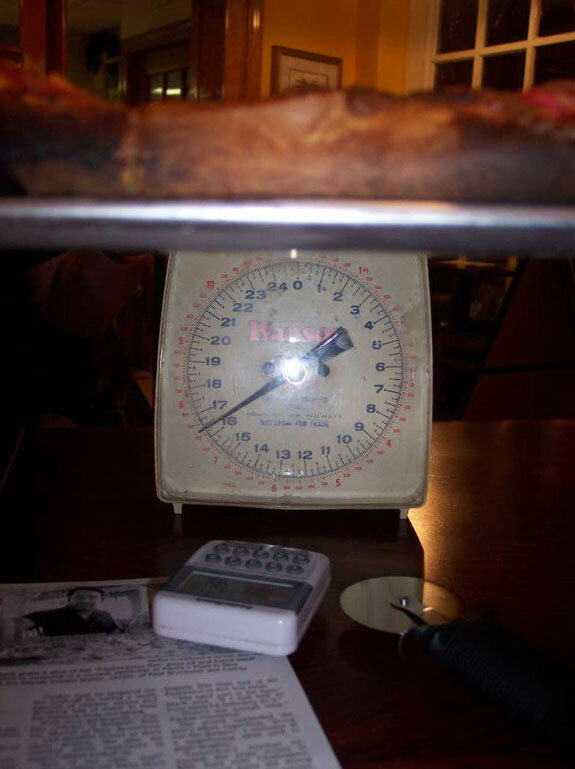 The $250 I received will be put to good use :-) Congratulations to Sonya with 5.75 lbs for first; to Tim Janus, Eater X for 4.0 pounds for second (he beat me by about 2 wings, getting $750, wow, those were TWO VERY EXPENSIVE WINGS FOR ME!) to Big Brian Subich and Chip Simpson with 3.2 lbs each for 4th and to Crazy Legs Conti with 2.9 lbs for 5th. The top 5 finishers to go the finals in Boston on November 12, 2005, but unfortunately I have a prior committment that day and will be unable to attend. So this will open up a spot for Crazy Legs. I had forgotten all about this committment and only learned of it again, when I went to pencil in the finals on my calendar and discovered the conflict. Anyway, these were delicious wings and Union Jack's was even nice enough to give me some to bring home to Sabrina and Rascal, my pooches. When I got home, I pulled the meat off the bones and dropped it right down into their eagerly salivating jaws. As always, nice memories and a fun time was had by all. I wish the best of luck to all the eaters for the finals in Boston on November 12, 2005 and may the best eaters win! Hope you enjoy the photos, taken by my biggest and most loyal fan, aka known as my official photographer, Lorraine "Lorraineasaurus Rex" Lipsitz. 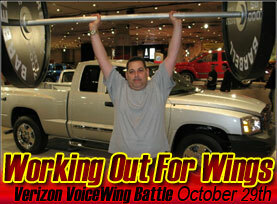 Hello this is Cousin Chubby; Don Moses Lerman will be going to Washington D.C. for the Verizon VoiceWing Battle on October 29th. Moses is well respected when it comes to eating wings he holds a 2nd and 3rd place title at the Philly Wing bowl and a 2nd place at the Buffalo Wing Contest. This year he’s going for the gold! Also attending is Krazy Kevin Lipsitz (a 4 time Philly Wing Bowl Finalist) and Brian Seiken as well as Brian Subich and not to forget Sonya Thomas. Don Moses will also be going to Knoxville Tennessee On November 13th for Krystal Burgers. Good News Don Lerman Fans! In a month or so will be the debut of MosesNews.com which will be its own website but integrated into DonMosesLerman.com. It will have daily updates on all the news in the Competitive Eating IFOCE Circuit and readers will be allowed to write in their comments which will be submitted for approval. Myself, Gustoff Zhychick, and Krazy Kevin Lipsitz will still appear and will be the format for pictures and commentary as well as the Moses Museum. A Portuguese/Spanish Restaurant where for about $29 a person you can eat like a horse. Order the Rodizio where they bring out skewers of assorted meat; no limit to each table! Until next time goodbye and see you at Washington D.C.
Gustoff Zychick undergoes emergency colostomy. Cousin Chubby refuses doctor's orders to receive stomach bypass. 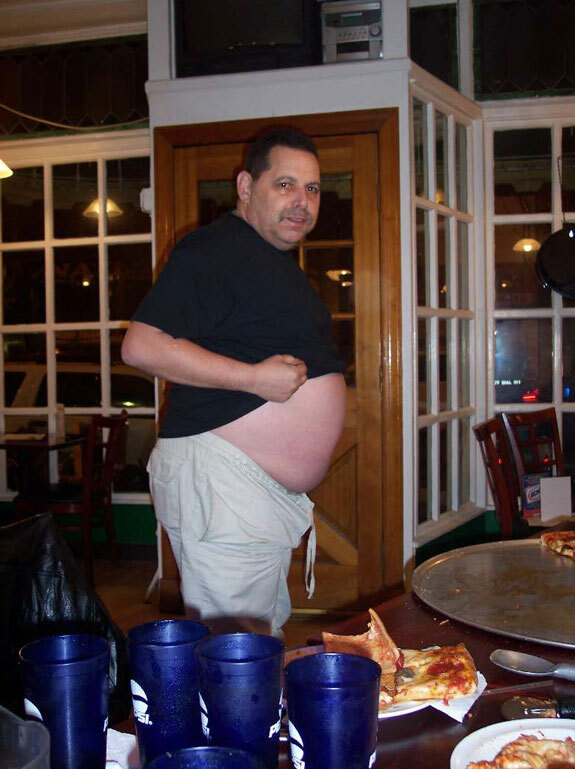 Fans this is Cousin Chubby, a sad note yesterday Gustoff Zhychick underwent a colostomy after years of dealing with a double hernia and wearing a truss. 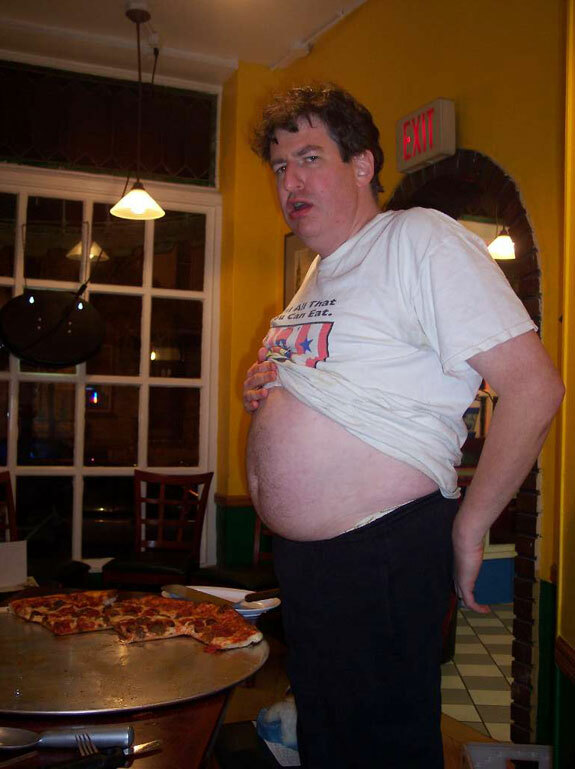 He wants his fans to know he is well and when he gets home he will start his school of competitive eating. Learn all aspects of competitive eating: How to eat a wet roll, The 2 handed pelmeni method, Dunking the dog, Japenesing (separating the dog from bun), Learn wing stripping, Hamburger shredding, and much more will be taught by the ultimate master of competitive eating Gustoff Zhychick. Tuition will start at $10,000 for a six month course. As you know I refused stomach bypass surgery however I will be going on a diet along with don moses this fall and will limit myself to only 2 chinese buffets a week. Anyone who can eat two of their THREE POUND burritos in one sitting, gets them FREE. The rules, must be done in one sitting and you cannot stop for a break. No cigarette breaks, no bathroom breaks and presumably, no bowel movements at the table, although we did not ask. 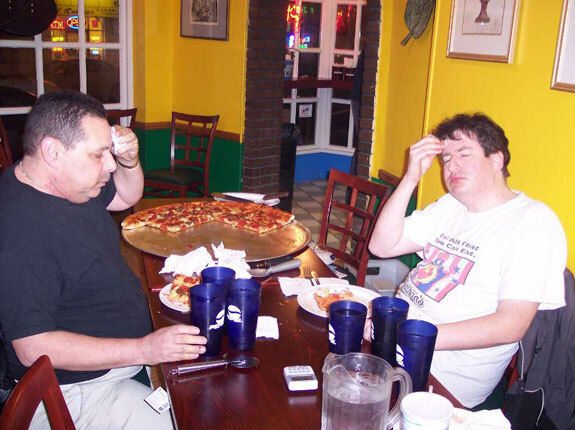 Now that is a challenge that any veteran competitive eater cannot take lightly and Moses and I plotted the day of attack. We chose the Saturday of Memorial Day Weekend to attack, with the goal of being the first two people to ever take the challenge head on and demolish it. The owner, Chris, told us on the phone (he had NO idea who he was REALLY speaking to), that there was a Wall of Shame and a Wall of Fame. So far, only the Wall of Shame was populated and no one was worthy of the Wall of Fame. Moses, Lorraineasaurus Rex and myself arrived at 6:00 pm sharp. Moses and I walked innocently up to the counter, like putzes, hiding our timers and ice cream scoops and knives in our pants. We asked how much the burritos were and how big were they. They told us about the small and medium ones and we asked if they had something a wee bit bigger. They told us about the MONSTER BURRITO'S, $9.50 for Chicken and $10.50 for Steak. I next asked if there was some sort of challenge if you ate two. We thought we might have seen something in the paper. He then proceeded to show us how big they were and I said to Don, what the heck, we can always put them in doggie bags and take them home for our doggies. The owner smirked and barked the orders to the kitchen to begin preparing the monsters for the schmucks who just walked into his establishment. Lorraine decided to try to eat one and Moses and I ordered two each. Don chose water to drink and I chose soda, normally a bad choice for an eating contest, due to the gas build-up and feeling of bloating that can come from too much soda. Moses got his burrito's first and I patiently waited for mine. We were going to start together. Lorraine's and mine came out together. All I could say was MUCHO GRANDE, MUCHO GRANDE, with a (phony) look of horror on my face, as if to say, I just paid $21 for two burritos and there is no way I am going to do this. Meanwhile, inside, I was doing the smirking. Then Moses and I got serious and stopped all the charades for the owner. 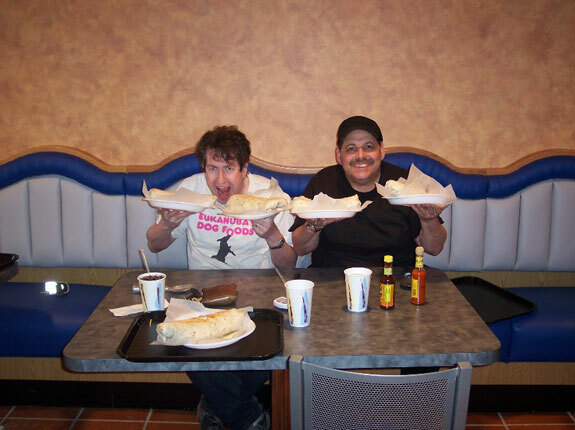 Now that our burritos were made, they could no longer get bigger because of our reputations, during their preparation, as had happened to Don, Ed Cookie Jarvis and I at a previous challenge at another establishment.. We whipped out the ice cream scoops, Don's timer and Don's knives. A look of fear came over Chris, the owner's face. He saw the plastic bags and thought for a moment that we were going to hide some of the burrito, ie. cheat. Then he saw the timer and ice cream scoop and wanted to know what that was all about. He really did not know what to make of these three gringos who seemed to now be laughing at his challenge and mocking it. We told him these burritos were going DOWN and we would be outta there within 30 minutes. Oh, and by the way, bring over the camera. The smirk was gone and a serious face came over Chris. Lorraine did the countdown and we attacked. I picked the monster up like a snake and bit off its head. Within 10 seconds, I had a third of it all in my mouth. Shortly after that the monster gave up, became viscerated and exploded all over my plate, as it fell apart. I was very careful to keep ever bean, even onion piece, every pepper, every piece of the tortilla wrapper and every piece of steak on my plate. Moses slit its belly with the knife right away, like a fisherman on a boat, about to fry the fish he just caught, right down the middle and then scraped out its' innards all over his plate. Then then attacked with a vengeance, similar to his possessed demeanor when he set the baked beans world record. The race had begun. No doubt about that. Chris the owner left the counter and came over to sit at the next table to take a look at what was going on. The restaurant had just opened a few weeks ago and every dollar counts during a restaurant's opening weeks. 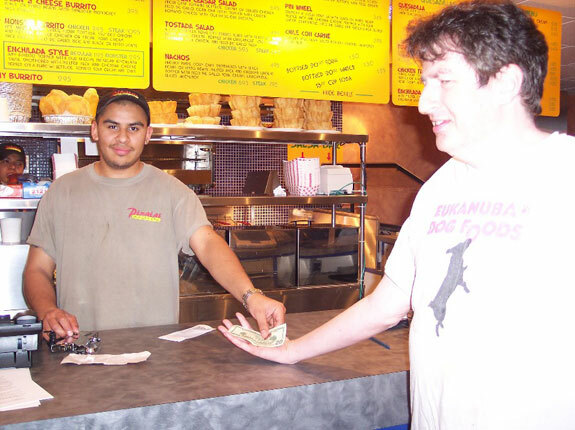 I think he begun to realize that he just donated $40 worth of burritos to these two "putzes" who maybe really were not two putzes after all....... and figured as long as he was going to lose 40 bucks, he might as well get a free show out of it. As other patrons walked in, he announced to them that history was being made. Shortly before our burritos came out, a nicely dressed couple, with their two children walked in and took the only available table, next to myself and Moses and Lorraine. They placed their order and it arrived shortly before ours did, as their portions were normal size and were easier and faster to prepare. They had no idea what was going on, but a look of disgust came over their faces, as they realized two real pigs were at the next table, setting a very bad example for their children, whom they were trying to teach some table manners and fine dining etiquette. This other couple ordered their food and it came quickly for them. At this point, Moses and I started belching, me more so than Moses due to the carbonation from my Diet Coke. This actually turned out to be a blessing in disguise, freeing up more room in my stomach. Moses cut loose a real noisy smelly fart and not to be outdone, I followed suit. I tried to make mine musical, so the couple next to us would not think it so bad. This really helped give us a second wind, although the wind that it created was really smelly and the couple next to us was getting even more disgusted. They were NOT amused. Their kids though it was funny, until their parents silenced their laughs. They almost left, but I think they decided to stay in order to show their kids how not to behave in a restaurant. The farting and belching was getting out of hand, but Moses and I were possessed and began for forget that we were in a restaurant, not a free for all, win at all costs eating event! The first Burrito went down for Moses in 3 minutes, 49 seconds and mine went down in 5 minutes flat. Midway through the second burrito, the pounds took their toll and we both slowed considerably. Eventually Don looked like he was going to suffer urges contrary to swallowing and he was turning greener than the Guacamole dip on the table. Chris, the owner, feeling that it would be easier to catch the vomit rather than mop it up, acted quickly and grabbed a huge trash can. However, as Moses has often done in the past, he recovered quickly, was it all an act? .......... and polished off his second burrito. Moses's grand total for both burritos, 19 minutes, 1 second. During Moses last few seconds, I considered shoving what was left on my plate into my mouth (just part of the soft torilla shell was left), but decided against it, as it would be sort of cheating and this was a friendly competition and I also might have lost everything I had put down. .......and after all, this was about getting a couple of FREE burritos and what good would it be, if my free burritos were all over the floor, instead of my stomach. Being the thrifty minded soul that I am, I suggested rather strongly to Lorraineasaurux Rex that she should eat a second one, so we not have to pay for her meal, but the look I got from her convinced me that that would not be a good thing for me to keep suggesting. Also, as she reminded me, she was holding the keys and it was a long walk back to Staten Island from Bethpage, so I decide to acquiesce. At that point, we told Chris who we really were and told him, if he were interested, we could send down all our eating friends. He assured us, he was not looking for us to encourage that, but a challenge is a challenge and for anyone who is interested, you can reach Pinata's at 1-516-681-8282. As of this writing, there are only two faces on the Wall of Fame, but we would not mind sharing some of the space with our eating friends. They make a VERY DELICIOUS BURRITO and it IS big WALL OF FAME. ......and if by chance, you wind up on the WALL of SHAME, there is always NEXT time. This article may not be reprinted without the express written permission of Kevin Jay Lipsitz. © 2005. This article may not be reprinted without express written consent of Kevin Jay Lipsitz. Hello once again this is Gustoff Zhychick. Many years ago I had the privilege to go to a store front museum consisting only of Chinese take-out menus, it drew quite a crowd. 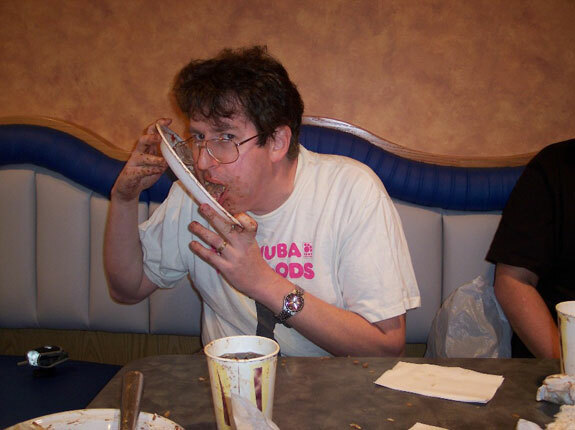 What we need is a competitive eaters hall of fame museum, not to be confused or take anything away from the Nathan’s wall of fame, which is in a class by itself, but a museum of all food contests. How it should work is any food sponsor who has an annual or one time contest pays a levy into a fund that is used to rent a store and have a caretaker. The cost to the sponsors would be minimal and all food categories would be represented. In other news I just want to say Don Lerman is alive and kicking, and kicking strong and says that he will be ready for the title rally if and when it occurs and will take on all challengers! Good bye for now. This is cousin Chubby, in this life you can lead follow or get out of the way, Don Lerman is a leader. The big bang started the universe in 1927 when Louis Armstrong joined the Fletcher Henderson band that started the big band era. 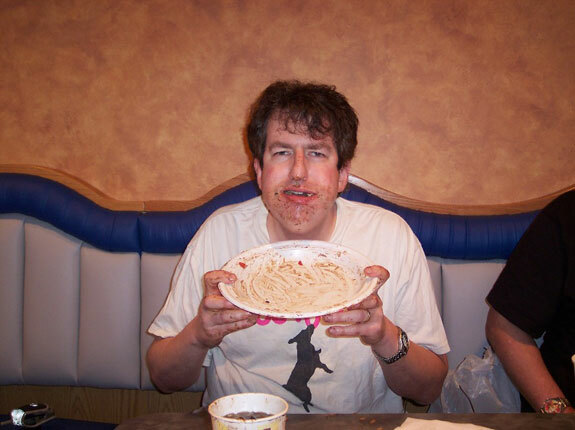 In 2000 Don Lerman (then matzo ball champ) crossed over to enter a Nathan’s contest that started the sport of competitive eating. Until then these were just local eating contests and eaters in one category would stay in that particular food item. 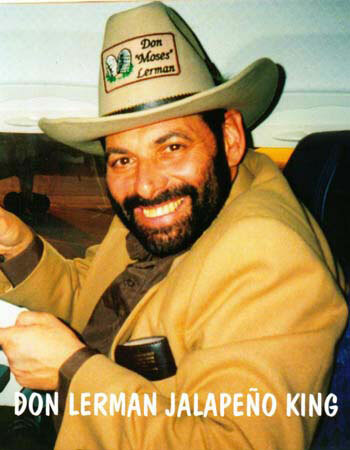 Don Lerman was the first to start with the embroidered jackets and hats and the photo shirts. Don Lerman developed the water technique which is widely accepted as the best way to expand the stomach without eating. Don Lerman went on tour in 2001 and entered every Nathan’s qualifier; out of 10 he won 7. 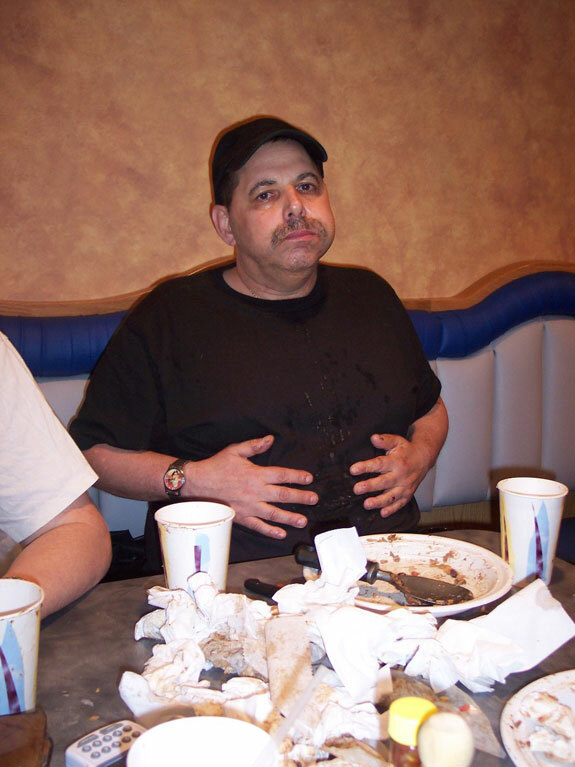 Don Lerman won the Coney Island promo twice setting a then record of 5 Hot Dogs and Buns in 50 seconds. 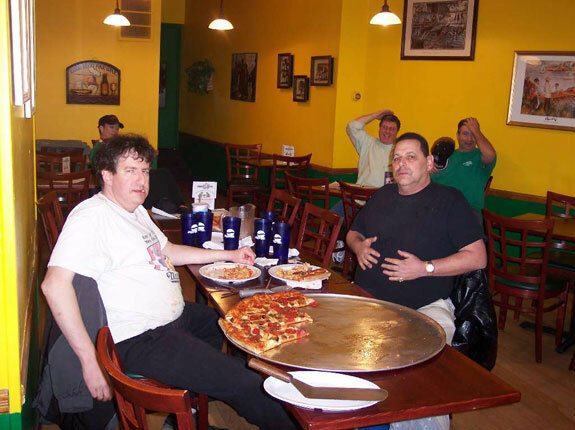 Don Lerman’s appearance in Gut busters and Big Eats inspired many people to venture into competitive eating. Don Lerman set the standard eating 6 lbs of Baked Beans in 1 minute 46 seconds. 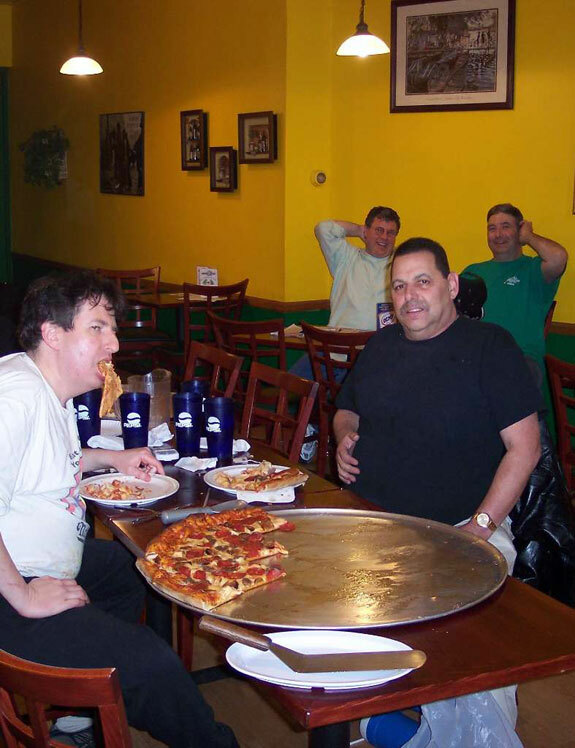 Don Lerman is responsible for eaters having their own nick mames; before this the promoter or the sponser or the press gave the nickmane, Don Lerman changed all that. Don Lerman is a true pioneer in the sport. 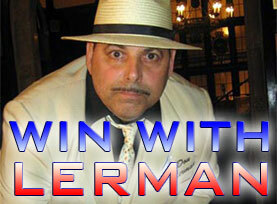 Recently Don Lerman gained 70 lbs in a matter of two months. His doctor said never has he seen anybody gain so much weight so fast. Don is nursing a broken foot so he cut out the exercise and it’s tough for him to loose weight, he is almost as heavy as me! He's 100 lbs heavier then he was in 2000 so he’s going to take a short hiatus from competing with the exception of a few contests. See you at the Wing Bowl!